Watering Reservoirs are a deceptively simple tool that will save you time and money by having to water less frequently as well as saving the environment by using less water and reducing runoff. Place the Planter Well 9? or less below the root ball and water through the white tube as needed. In addition to holding irrigation water underground right where the plant needs it and where it is less likely to evaporate, the Watering Reservoir from Planters Unlimited also collects and holds rain water. The Planters Unlimited Reservoirs come in a variety of shapes and sizes, designed to best suit your planting. Each Planter Well will irrigate 9" of soil beyond its edge, so one 12" water well reservoir will keep the soil moist in a window box or planter that is 21" long. Round Watering Reservoirs don?t just add green to your landscape; they add green to your wallet. If you have been thinking about how to make a self-watering planter, save precious resources and staff time in the process, consider adding resource-efficient Round Water Planter Reservoirs that provide a self-watering function. With any round reservoir added, you instantly have self-watering planters that provide excellent ways to hydrate your plants consistently and save water in the process. These ecologically sound mechanisms are an ingenious method to convert an ordinary planter into self-watering planters in a DIY fashion. From small to large self-watering planters, from ground level containers to self-watering hanging planters, our Round Watering Reservoirs will add to your plant's life and reduce your water bill. The self-watering reservoir is actually quite simple. 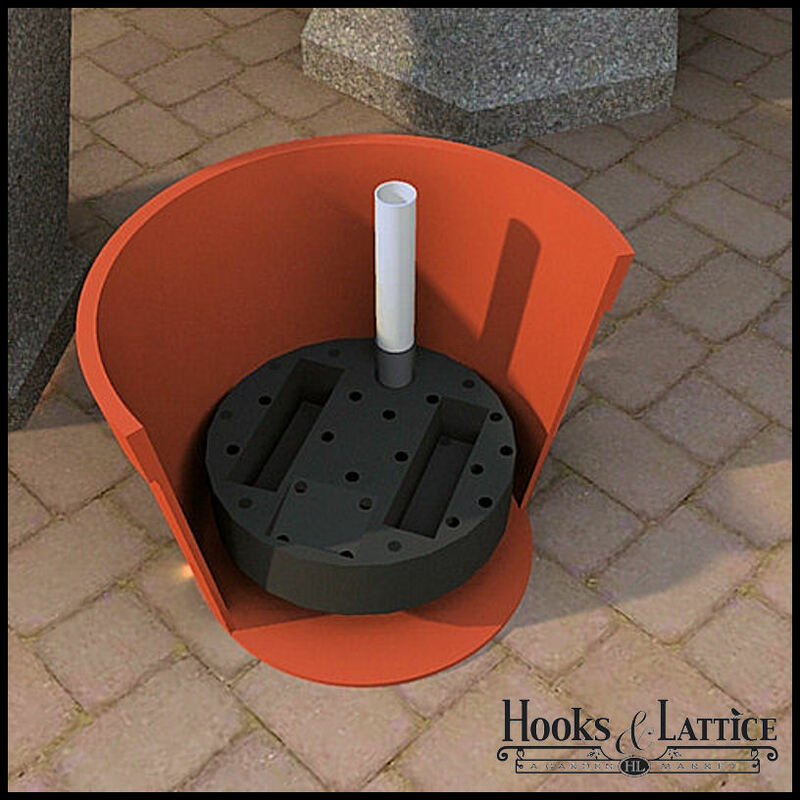 Comprised of a plastic hollow platform that sits at the planter's bottom, there is a white watering tube along with a number of small holes to allow water at the bottom of the planter to be either wicked away from the plant or to draw water up to hydrate the plant's roots. When water is held at the bottom of the planter, it is less likely to evaporate thereby preserving it for future use. With the ability to both store excess water and bring up water to the root system from the well reservoir, your plants can stay hydrated for up to 2 weeks. Plus, the minerals present in water and soil are preserved without losing them to evaporation. What's more, even rainwater can be collected from the plant as it seeps down to the reservoir for later use. Our round watering reservoirs are available in numerous sizes. Choose from a petite 6" reservoir up to a 60" fully rounded system. We also carry half circle reservoirs at 18" for a donut assembly designed for specific planters. In addition, we have 2 sizes of hanging basket planter reservoirs. In all cases, your watering time is reduced as is the propensity for plant roots to experience root rot compromising the health of your plant. For additional information on watering reservoirs or for different shaped reservoirs, please contact one of our customer service specialist today for further details.